Four former Seattle mayors and a former deputy mayor gather at the Folio library downtown on July 20, 2017. From left: Wes Uhlman, Charles Royer, Norm RIce, Maud Smith Daudon, and Greg Nickels. Seattle's former mayors have a lot to say about today's city politics -- and today's traffic. 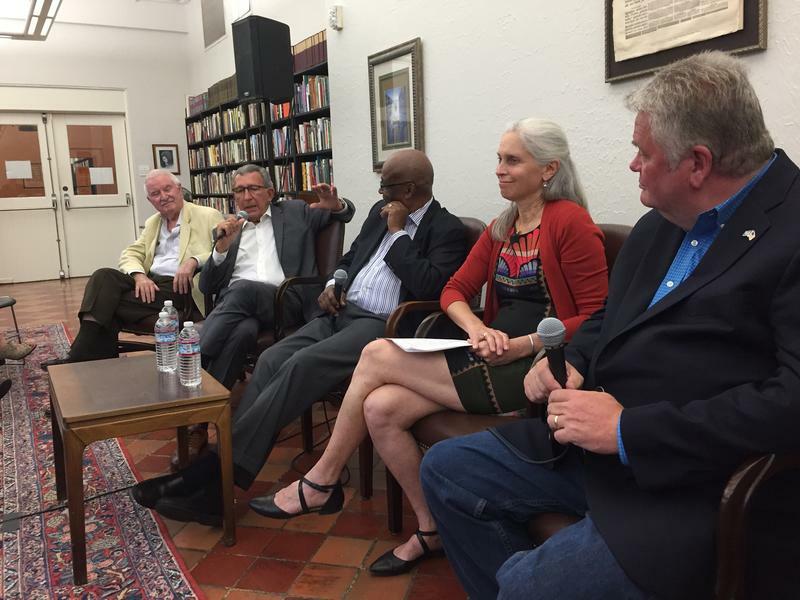 Four ex-mayors and a former deputy mayor sat down for a talk Thursday evening at the Folio library in downtown Seattle. Combined, they ran or helped run Seattle for four decades. Some of them ran against each other. But there was a moment when almost all of them agreed. They were talking about the city’s spending, which has grown by about 25 percent over the past four years, during Seattle’s continuing economic upswing. "I would say enjoy the sunshine, but winter is coming," said Greg Nickels, who took office in 2002, not long after the dot-com bust hit Seattle's economy. "We have an economy that goes up and down in pretty dramatic fashion," he said. "Right now we're in a pretty good time." But he predicted that good time would end. Then Norm Rice chimed in. He said it's part of the mayor's job to "say no" to the City Council. Rice served as mayor between 1989 and 1997. But he was on the City Council before that, where he said was the one asking the mayor for money. In fact, he is the only person to ascend from the council to the mayor’s office in half a century. He said he learned a lot from switching roles. "Someone has to say no," he said. "It's about courage. Remember, everybody wants something." Then their attention turned to the most senior of the mayors present: Wes Uhlman. Shortly after Uhlman took office in 1969, Boeing began the process of cutting tens of thousand of jobs in the Seattle area. The layoffs rocked the city's economy. Uhlman was forced to slash Seattle's budget. He recalled laying off police officers and firefighters. So what advice would he give the next mayor? "I would first of all tell her, when she called me, that you're going to be the only adult in the room," Uhlman said. Seattle hasn't had a female mayor since the 1920s, but Uhlman predicted that would change soon. His advice to her: That she should know how to use her veto power, especially on spending proposals. Also present was Seattle's longest-serving mayor, Charles Royer, who held the office from 1978 to 1990. The only mayor missing from the four-decade span was Paul Schell, who died in 2014. He was represented by his deputy mayor, Maud Daudon. Asked about the biggest issues facing Seattle today, four of the panelists mentioned transportation. Most of them praised the current slate of mayoral candidates as strong. That's except for Uhlman, now 82, who called them a "boring bunch."